Fuel dumped in Bullsbrook last month could have contaminated a priority 1 drinking water source. FUEL dumped in native bushland in Bullsbrook last month could have been “catastrophic” if it got into the local water supply, according to the Department of Water and Environmental Regulation. 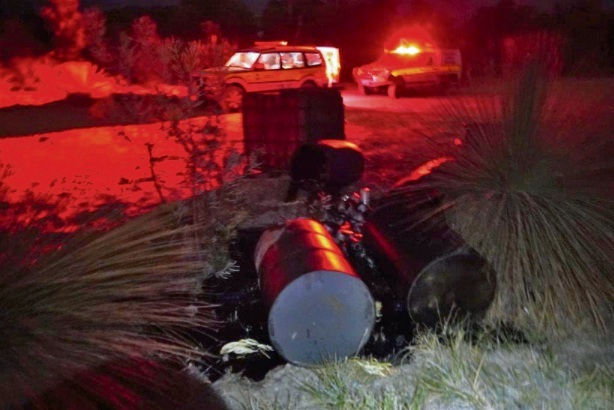 Drums of oil, diesel and engine filters were found discarded and leaking in native bushland on Warbrook Road by a member of the public. Quick action in reporting the leaking fuel resulted in pollution response officers being dispatched to the scene immediately and meant the fuel did not leak into ground water. Department executive director of compliance and enforcement Stuart Cowie said the area where the fuel was dumped is a priority 1 drinking water source zone of the Gnangara Underground Pollution Control Area. He said it is believed the oil was dumped in the early evening of Friday March 23. “We are hoping that someone may have seen vehicles in the area at the time or heard someone talking about this,” he said. Mr Cowie said there was no excuse for illegal dumping anywhere, but discarding oil and diesel into a protected ground water area for Perth’s drinking supply had the potential to not just damage the environment but the water used for drinking. He thanked the member of the public who reported the incident and the officers from the Department of Biodiversity Conversation and Attractions who assisted the clean up. “In this particular area the aquifer is very close to the surface and this amount of fuel could have been catastrophic for its use as a drinking water supply,” he said. “By allowing us to respond quickly to this event we were able to commence a clean up before the fuel and oil had time to seep into the groundwater,” he said. Anyone with information regarding the dumping of the drums or any other illegal dumping is asked to call the Department of Water and Environmental Regulation population hotline on 1300 784 782.